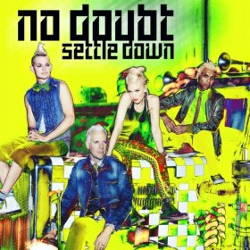 No Doubt have released the video for their comeback single Settle Down which is featured on their forthcoming new studio album Push and Shove. The video is directed by Sophie Muller who has previously directed several music videos for No Doubt including Don't Speak, Excuse me Mr and Sunday Morning back in 1996. She also directed some of Gwen Stefani's best solo music videos including Wind it Up, 4 In The Morning and Early Winter. I love the gorgeous use of colour and light in the video which is perfectly No Doubt. Settle Down was written by No Doubt and was produced by Diplo. I love that Gwen dosen't appear until 40 seconds into the video reminding us that this is definitely a No Doubt song and not another solo single.